Caffeine is a natural chemical found in tea leaves, coffee beans, cocoa (used to make chocolate), and colas. Today, caffeine is found in many common foods and drinks, such as coffee, tea, cocoa, colas, chocolate, and some medicines. It is classified as a stimulant psychoactive drug that is typically used for its ability to arouse the central nervous system. Within about fifteen minutes of consumption, a caffeinated beverage can cause the drinker to feel more alert. 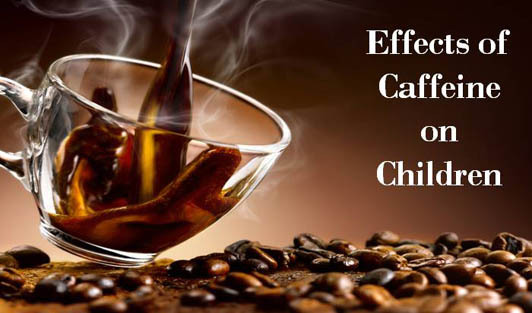 Although generally recognized as safe by the Food and Drug Administration, caffeine use in excess can result in serious, associated symptoms like caffeine withdrawal, caffeine dependence, caffeine-induced sleep disorder, and caffeine-induced anxiety disorder. Below are some of the common problems, the children might face due to excessive caffeine consumption. Caffeinated beverages like coffee, tea, and colas are often substituted for nutritious beverages, such as milk and juice. Frequent consumption of these beverages can fill your child's stomach, reducing the appetite for nutritious foods. This can contribute to a lack of overall nutritional value in a child's diet. Children who consume more caffeine may have difficulty concentrating at school. They may be prone to emotional responses. Some of these symptoms include lethargy, irritability, anxiety, restless, and difficulty to think clearly. Kids Health states that children may feel the effects of caffeine for up to six hours. Caffeine tends to break down more slowly in children than in adults. If your child consumes caffeine too close to bedtime, it can make it difficult for him/her to sleep. And when they feel tired in the morning, they may crave caffeine to help themselves wake up. This can create an unhealthy cycle. Caffeine is a diuretic, which can cause a person to urinate more and may also lead to dehydration when it is not compensated with drinking enough water and liquids. So it is always considered safe for the children to stay away from too much caffeine especially during hot weather, physical activities, or in other situations where your child might sweat a lot. Encourage your children to choose healthier alternatives when they are at home or school or out with friends, which can thereby limit the caffeine content in their body. Copyright 2019 Truworth Health Technologies Pvt. Ltd.
Looks like you've been here before. A One-Time Password has been sent to your registered mobile number.